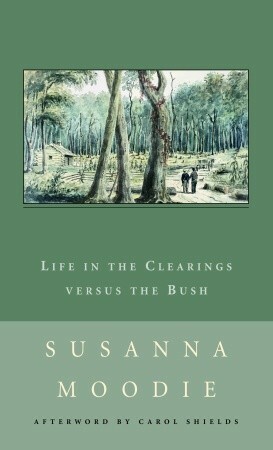 Susanna Moodie continues chronicling her experience of mid-19th century Canadian life in Life in the Clearings Versus the Bush, the sequel to Roughing it in the Bush. After her husband obtains a job as a sheriff in Belleville, a small Ontario town, the family leaves behind their backwoods homestead north of Peterborough, where they battled the harsh elements of unforgiving nature but also felt the blessings of a providential and caring Creator God, with mixed feelings. In Life in the Clearings, Moodie turns from personal matters to sketch little vignettes of Canadian society and culture in the towns, although “vignettes” perhaps suggest a more impartial tone than Moodie projects. Rather, her discussions of Canadian customs and traditions are usually either hypercritical or gushingly enthusiastic. It’s helpful to consider who her audience is: middle class readers in Victorian England, where her book was published. This is why she spends so much time analyzing the advantages and disadvantages of class structure in Canada and how it differs from her native shores, England. “You feel a thrilling, triumphant joy, whilst contemplating this master-piece of nature – this sublime idea of the Eternal – this wonderful symbol of the power and strength of the divine Architect of the universe….